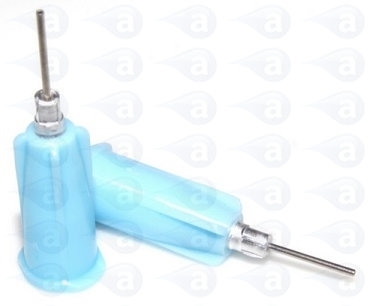 TS tips have a crimped tube to hub so are perfect for dispensing solvents and solvent based glues. The hub is opaque so also good for handling UV cure adhesives. The TS Series dispensing tips offer a variety of dispensing performance and flexibility options. Stainless steel tubing is cut to precise lengths and ground to be burr-free. Cut tubing is crimped into aluminium locking insert, then moulded into polyethylene hubs. Moulded hub colours correspond to gauge size. TS tips secure to syringe barrels and correspond to the luer lock specification. Opaque plastic hubs are ideal for use with UV cure adhesives. Offering the widest range of dispensing tips for use with syringe barrels, dispense bottles, dispense valves and robots. All tips are industrial grade safe for use to 100 psi air pressures and are certified silicone-free. 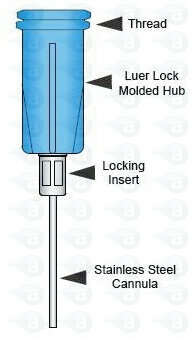 Luer lock secure attachment for leak free dispensing. All parts ship direct from stock.